Flaming shots sound like a lot of fun until something goes badly and you get sued. This is a common exclusion in almost all restaurant policies. Liquor liability typically requires a separate policy. Check with your insurance agent to see if your liquor liability policy includes coverage for flaming shots if you plan to offer this to your customers. Nathan’s Famous Hot Dog Eating Contest has been an American staple for several years. Are you thinking about having an eating contest for your hot wings or maybe your 5-pound burger? You may want to reconsider as this is also excluded under general liability on your restaurant policy. While some insurance companies do offer this on their restaurant insurance policies, others do not. Food contamination can happen and you want to make sure you are covered if a patron finds themselves in the emergency room after eating at your restaurant. Are you prepared to replace all your food if there is a power outage long enough to spoil it? Some companies will say that they provide it in an enhancement, but it usually only includes a small amount such as $25,000. Certainly not enough to replace everything depending on the type of restaurant you own. 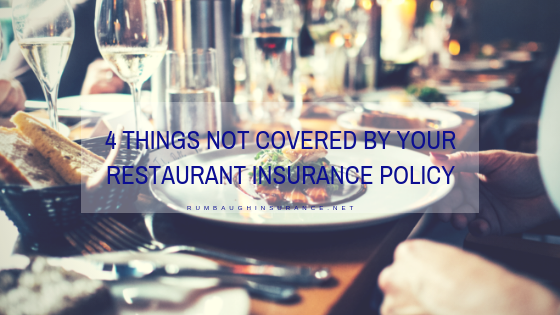 The bottom line is to always read your policy and discuss with your agent all the things you plan to offer at your restaurant. Rumbaugh Insurance is educated in these types of policies and is ready to go over your situation and make recommendations. Get in touch with us today.